We all use sheds for different things; some use them for storage, others use it as a workshop, while others turn their sheds into some sort of man cave. Whatever you plan on using your shed for, one of the most important steps is the erection process. Once you have decided you are getting a shed, there are some things that you will need to get right from the beginning, to ensure that you make the most of your investment. What good is a shed if you cannot get to it in a pinch? It is important that you choose a place that is accessible for your shed. For instance, if your shed will be used primarily for gardening purposes, it is important that it is as close to the garden. This means that you can be able to access gardening tools and implements such as fertiliser, which in many cases tend to be quite heavy. If you are using the shed for storing such things as a lawn mower, it is important to make sure there is a clear path to ensure it easier to get it out and remove. When setting up, it is always better to go for as big a shed as possible. This follows the rule that is better to have a lot of space to fill, than to need space and not have it. Having a lot of space in your shed also expands the number of uses. When deciding just how much space to allocate to your shed, also consider what you will put in it. A shed that will be used as a child’s playhouse can be smaller than one which will be used to store workshop tools or farm equipment. You should also consider the number of people that will be working in it at a given time, and whether they can walk around freely. As an outdoor structure, your shed should be built with longevity in mind. As such, this means that at the moment of setting up, you should consider both the material used to construct the shed, and the placement of the shed on our property. Sheds made of metal sheeting will, for all intents and purposes, last longer than those made out of wood. 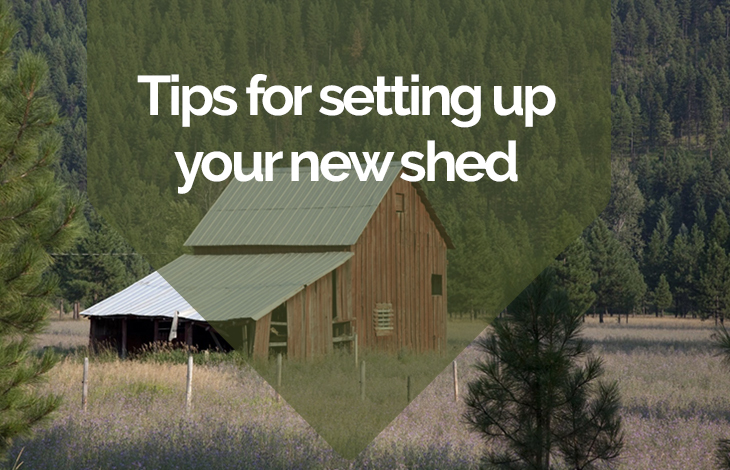 When it comes to placement, choosing where erect your shed is key. If you out it up in a place that is ever wet, it could damage the foundation and the materials. Constant scraping by branches when it is windy is also detrimental to your paintwork and the roofing. With sheds, no matter what they will be used for, having a reliable and proper source of light is important. If it is going to be used as a gardening shed for instance, you should have enough light to be able to find implements and tools. When using it as a workshop, light becomes even more important, so as to avoid accidents when using power tools and sharp objects. Adding an electrical source with proper work lamps solves this problem, and ensures you have light even during the night. Having a properly aired out shed is vital. This means that you should make sure your shed has enough windows and air vents. Proper ventilation makes it a nice place to work in, since it airs out any dust and wood shavings in your workshop. Ventilation is also important for any garden shed, since some of the materials have fumes that may be toxic if not properly taken care of. This includes pesticides and petrol. Pay attention to what your shed looks like. A shed should be useful, spacious and most of all it should not be an eyesore. Some people like their sheds to blend in with the surrounding, meaning they will most likely paint them with dull earth colours. For those that like their sheds to stand out a lot more, brighter shades is definitely the way to go. You should also invest in paving the way to, and around your shed. This will not only look good and increase accessibility, but also make it easier to clean. Try and make your shed as comfortable as possible to be in and use. One of the ways to do this is to make sure whatever is in the shed is arranged in a proper manner, that gives it an airy, home feel. You should also invest in adequate, proper storage in order to make the best use of the space. Vertical shelves, storage hooks, and peg boards are some of the options you could consider. Not only do they make organisation easier, they help you know exactly where something is, and make it easier to reach it. Finally, invest in a proper door, with regards to size and structure. It makes it easier to move bog things in and out of the shed, while providing a level of security at the same time.